As for those ZIP files containing the 1L / 2L / 3L stuff, the links are in the picture below. I didn’t embed them due to spammers in Russia, China and a few other countries who seem to enjoy hotlinking my files and trying to kill my bandwidth, so you’ll have to type the URLs in by hand. Sorry. Remember these are pretty hefty files, so the downloads are going to take awhile. 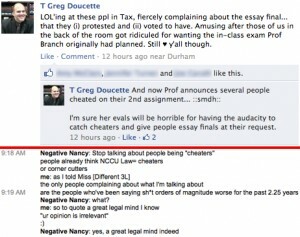 Have a great night and *GOOD LUCK* on final exams! Gone ’til the weekend — happy Thanksgiving! law:/dev/null will be on hiatus until I get back to the Bull City. *THANK YOU* as always for letting me borrow your eyeballs for however-many-minutes of your day, and I hope you and your families have an amazing Thanksgiving! Now normally I wouldn’t care; people complaining about professors is how I’ve learned who to take and who to avoid over the years. 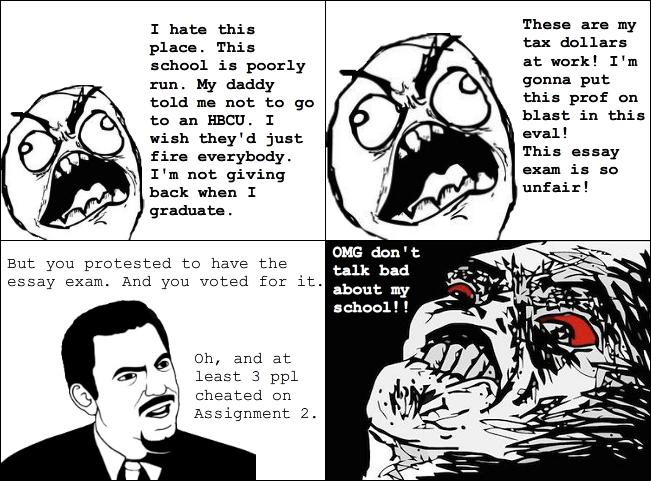 But Prof Tax said at the beginning of the semester that she was going to give us an in-class exam and these people protested. They protested with sufficient intensity that the Prof let the class vote on whether they wanted a take-home exam or an in-class exam, and these people voted for the take-home over the objections of those of us in the back of the room. 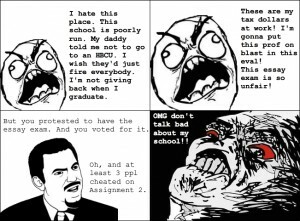 So after the “Prof Tax is evil for giving us what we asked for” convo went on and on (and on) I got annoyed and posted a status on Facebook. Two have practically identical responses, and a third is copied not-quite-verbatim from a professional supplement. 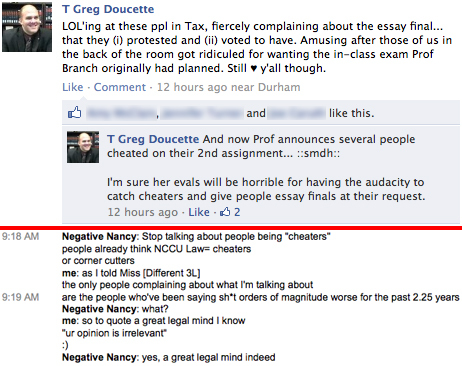 Predictably the Prof was displeased, the individuals in question will be getting 0’s on the assignment and referrals to the law school’s Disciplinary Committee… and I added a comment to my own FB status (posted to the right). The ensuing Gchat conversation is what set me off. For all of NCCU Law‘s merits — see, for example, the “Why NCCU?” entry linked above — we’ve got a small-but-vocal group of students who do nothing but complain all. the. damn. time. And I don’t mean substantive complaints that point out correctable flaws, or folks who complain but offer solutions. I mean people who constantly gripe in general terms, and on those exceedingly rare occasions they offer any specific critiques they then categorically refuse to offer any constructive advice (and even when their concerns are addressed, no resolution is ever good enough). They’re such an annoyance to other students that I actually wrote a memo to the faculty back in September proposing changes to the types of folks we admit in an effort to address student concerns. I get it: some people just aren’t happy unless they’re unhappy. Every school’s got them, as anyone in Student Government or a Student Bar Association can attest. Maybe I could do a career in radio? Good evening y’all, and welcome to the weekend! Each week during the academic year, we host something call iSpeak Blog Radio talking about a variety of First Amendment-related topics. You can access the main website, including the archived shows, online at http://www.blogtalkradio.com/ispeak. The operators of California’s Bay Area Rapid Transit (BART) public transportation subway system pay mobile phone providers to offer mobile phone service throughout the Transbay Tube. Mobile transmitters/towers exist throughout the BART system providing cellular coverage. BART maintains physical control over the towers, including providing electrical power. On July 3rd, 2011, BART police shot and killed Charles Hill at its Civic Center Station in San Francisco. Hill was a homeless man who was allegedly inebriated, and was reportedly armed with a bottle, two knives, and was “acting aggressively” toward police when he was killed. The official security camera video released by BART is inconclusive (the YouTube video can be seen at the link below). This was the third fatal shooting by BART police in three years. The first, occurring in the early morning hours of New Year’s Day 2009, resulted after police arrested and handcuffed Oscar Grant for disorderly conduct at the Fruitvale Station in Oakland. While Grant was handcuffed and prostrate [face-down] on the ground, Officer Johannes Mehserle pulled out his revolver and shot Grant in the back. Grant later died for his injuries and Mehserle served 11 months in prison for involuntary manslaughter: Mehserle claimed in court he intended to pull his Taser instead. Following Hill’s July 2011 death, the group “No Justice, No BART” organized a protest at several metro stations beginning at 4:30pm calling for BART to be disbanded and the officers who killed Hill to be criminally charged for yet another killing. As the crowd grew in size, some protestors attempted to prevent trains from departing and service was eventually disrupted. Several stations were closed entirely as a result of the protest. A month later, BART claimed “[o]rganizers plann[ed] to disrupt BART service on August 11, 2011… us[ing] mobile devices to coordinate their disruptive activities and communicate about the location and number of BART Police.” BART officials cut off electricity to all mobile phone towers from 4:00pm to 7:00pm at four stations in an attempt to thwart the alleged protest. In the process, everybody (including non-protestors) lost mobile phone service in BART stations. ==> Did the alleged “credible information” obtained by Bay Area Rapid Transit, claiming an impending August 11th protest, satisfy the 3-pronged test articulated by the Supreme Court in Brandenburg v. Ohio (intent / imminence / likelihood) for infringing upon speech rights? ==> Assuming arguendo the Brandenburg test was satisfied, was the BART decision to end mobile phone service nonetheless an unconstitutional prior restraint on speech, particularly when BART acknowledges portions of its stations are “free speech zones” for lawful protest? ==> Assuming arguendo the Brandenburg test was satisfied, was ending mobile phone service for everybody (including innocent commuters) an overbroad — and therefore unconstitutional — restriction on protected First Amendment activities? NCCU Law Legal Eagles sweep mediation competition! 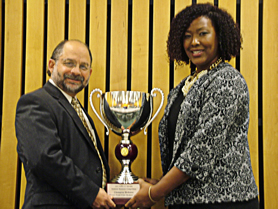 Nov. 14, 2011 – Leah Leone of the North Carolina Central University School of Law has taken the top honor at the Jeffry S. Abrams National Mediation Competition, held Nov. 11-12 at the University of Houston Law Center. As the winner, Leone received the Frank Evans Mediator Scholarship award, valued at $2,000. Presented by the Blakely Advocacy Institute and sponsored by distinguished Houston mediator and UH Law Center alumnus Jeffry S. Abrams, the competition allowed top law students nationwide to put their mediation skills to the test before a team of judges. “The competition went very well. There were 11 student mediators and the national reach of the competition was evidenced by the fact that students from California (UC-Hastings) to New York (St. John’s) were in attendance. The competitors, and coaches, were high in their praise of the competition, stating that the opportunity to learn from experienced mediators (as judges) in the competition context was one of the best experiences of their law school career,” said Jim Lawrence, Blakely Advocacy Institute Director. The final rounds saw Leone and Valoree Hanson, a student mediator also from the North Carolina Central University School of Law, being judged by Abrams; Tom Newhouse, University of Houston Law Center Professor emeritus; and the Hon. Frank Evans, generally recognized as the father of ADR in Texas. NCCU School of Law Professor Mark Morris was Leone’s and Hanson’s coach. Leone and Hanson came in a respective first and second place in the competition. Henson received the Jeffry S. Abrams Mediator Scholarship Award, which is valued at $500. UH Law Center students presently do not compete in the Abrams competition. The Abrams competition is designed to run in parallel with the Law Center’s Tom Newhouse Mediation Competition, where UH Law Center students participate as advocate/client in mediation. These intramural participants serve as the parties to the mediation rounds for the national competition. Team members Garrett Gibson and Frank Carroll won the Tom Newhouse Mediation Competition. Very cool, and CONGRATULATIONS to Miss Leone and Miss Hanson (and coach Prof ADR)! Thanks for putting up with another one of these non-entry entries Have a great night y’all!